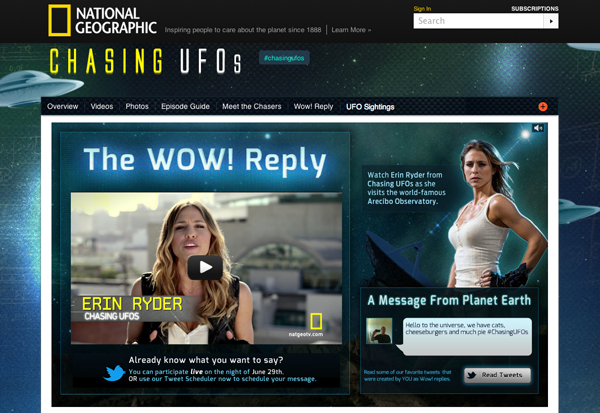 To promote National Geographic's new show Chasing UFOs, we executed what was possibly the craziest, most fun campaign I've ever overseen — broadcasting tweets into outer space to alien races, using the world's largest radio telescope. Our concept launched with an on-air and online teaser video, providing instructions on how everyone could participate in a twitter event, scheduled to coincide with the premiere episode of Chasing UFOs. On that night, everyone who tweeted using the hashtag #ChasingUFOs would get their message included in an interstellar transmission, timed to coincide with the 35th anniversary of when scientists first detected a strange signal from space — The Wow Signal. At National Geographic’s website, we launched an innovative tool – the “tweet scheduler,” which allowed people to plan their 140-character messages in advance, and set them to be automatically tweeted on the night of the event. We also invited “pop-culture friendly” celebrities to record short messages that would accompany the tweets. We received videos from comedians, scientists, sportscasters, musicians, actors and bloggers. In the run-up to the premiere, the project captured the imagination of mainstream viewers and entertainers, generating hundreds of blog posts, extensive press coverage, social media mentions and even coverage on network television. The night of the premiere, social media mentions topped 40,000, propelling National Geographic to No. 3 on the social TV chart. Additionally, the #ChasingUFOs Twitter hashtag trended organically across the country. As an earned media PR campaign, the program generated hundreds of millions of media impressions across TV, newspapers, websites and social media. And on August 15th, 35 years after the original "Wow Signal", we beamed more than 20,000 messages into space from the world-famous Arecibo Observatory, joining the small cadre of recognized Active SETI messages . "The Wow! Reply" and Chasing UFOs received extensive press coverage across hundreds of outlets, including: NPR, Ain't It Cool News, The Today Show, Fox News, NBC News, C|Net, Yahoo, Mashable, Huffington Post, Entertainment Weekly, SlashGear, Engadget, Lost Remote, MediaPost, Examiner, WebProNews, BetaBeat, PSFK and Creativity.